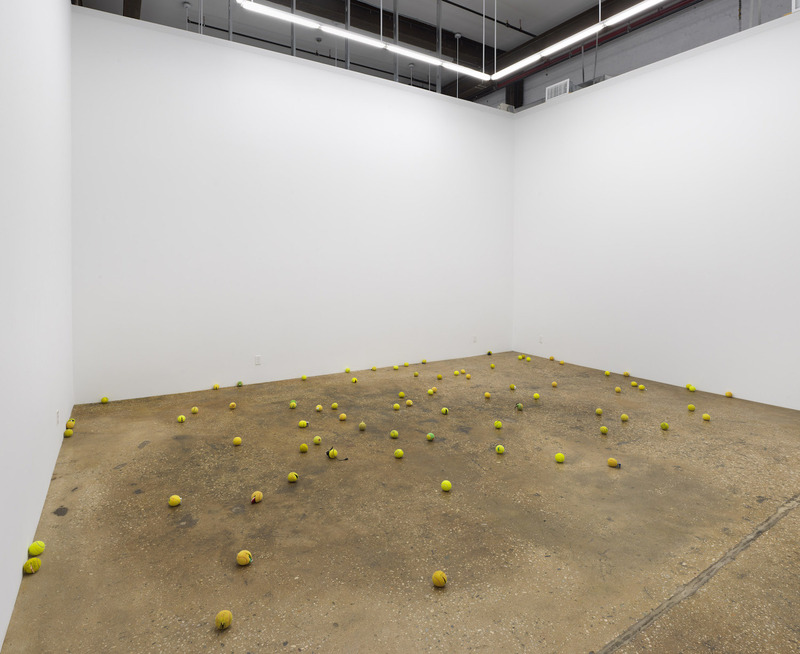 Installation View of Claire Fontaine, “Untitled (Tennis Ball Sculpture),” 2008. As far as French art collective Claire Fontaine is concerned, it’s a dog-watch-dog world. 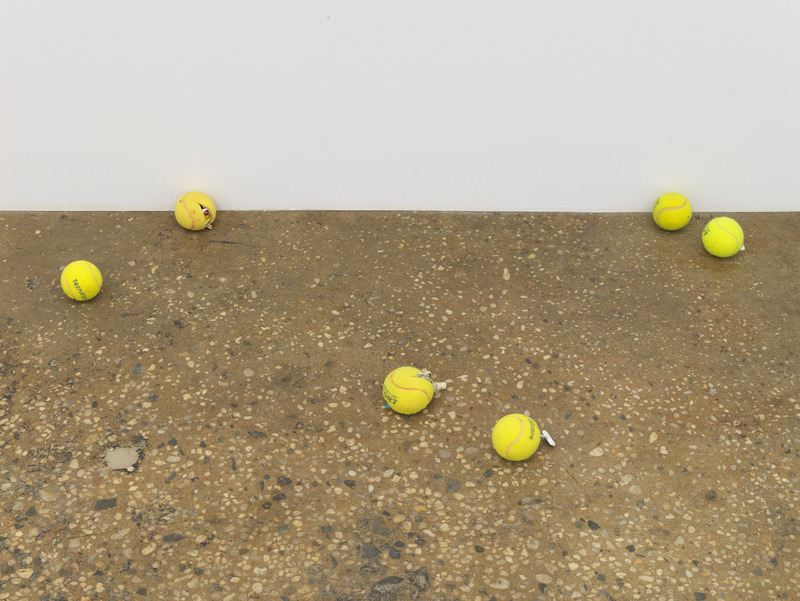 And in the group’s prison-yard sculptural installation (which opened this past weekend at Bushwick’s relatively new Century Pictures space) they underscore that outlook by use of a dog’s best friend: the tennis ball. Dozens of them, actually, all sliced open and stuffed with candy, cell phones, batteries, lighters. Everyday contraband, as defined by penitentiaries and detention centers the country over. During the opening, from a high corner of the gallery, a security camera remained pointed towards the crowd. Like all surveillance, it went unnoticed until it became inescapably noticed. And consequently, cued by first glances towards that unblinking eye, the blunt assessment of “someone looking at you looking at these balls,” was reiterated again and again throughout the night. 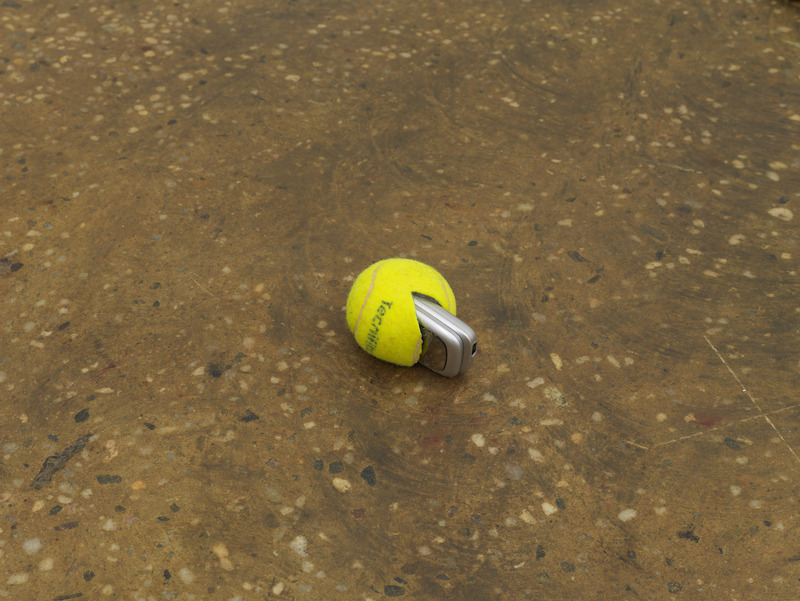 Untitled (Tennis Ball Sculpture) may be about ten years old, but the ideas behind it are especially prescient at present, what with social media shaping up to be our brand new Big Brother and the continuing fight for justice and reform when it comes to this administration’s support of the prison-industrial complex. Attendees were hyper-aware of being watched while in the space. 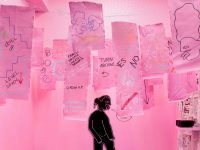 Rather than tip-toeing amongst the work, they policed themselves, pushing their own frames against the walls of the gallery in single-file lines and creating a wide separation between the acid-green balls that would have been thrown to inmates over prison fences and themselves, the gentility of still-gentrifying Bushwick. They kept out of the show’s mock prison-yard by staying in self-imposed art jail. Fortunately, some neighborhood students arrived later in the opening, and it was only when a few of them roamed through the room, muttering reactions like “There’s crushed up pencils in this one,” and “It would drive me crazy not to have my art supplies with me,” did the piece feel like it broke out of its own confinement.